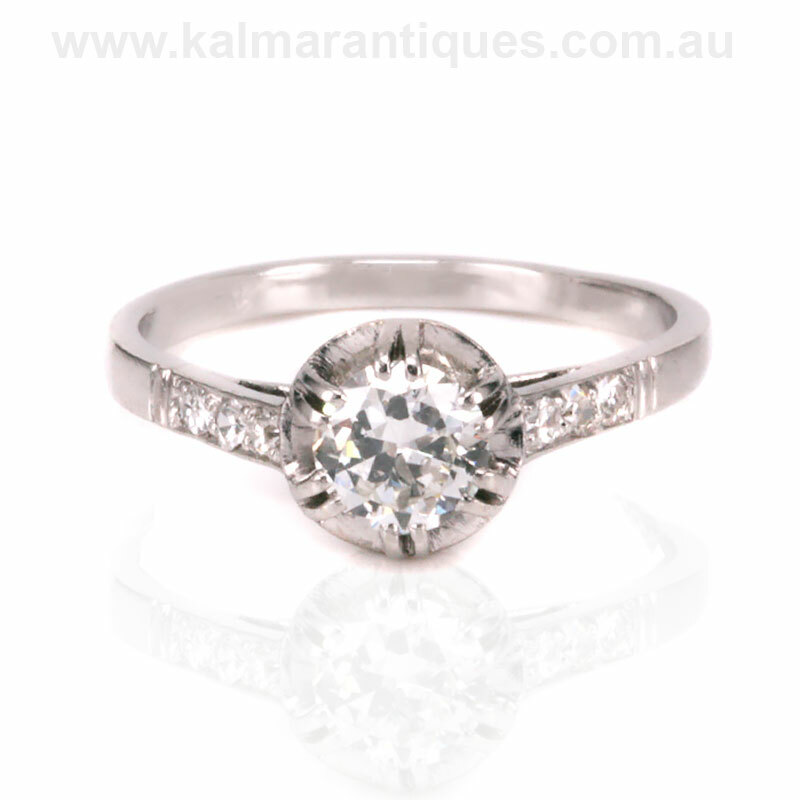 Product code: ES8377 Categories: Antique, Antique Engagement Rings, Art Deco, Art Deco Rings & Art Deco Engagement Rings. Rings made during the Art Deco period of the 1920’s to the 1940’s often took a traditional design, and altered it to a new fabulous design such as can be seen here in this very beautiful Art Deco diamond ring that was handmade in platinum the 1920’s. Starting with the traditional diamond solitaire, the jeweller that created this ring set the early brilliant cut diamond with traditional claws to secure the ring. However looking close you will see that each of the claws are split into two making such an elegant feature to the ring. However it is what is under the diamond that makes such a statement to this ring and exemplifies the thought and detail that went into making this ring. Under the diamond is a wonderful scalloped plate design that not only makes this ring so unique but also reflects the light so well back through the diamond as well as into the eye. This diamond measures 0.51 carats and with this section underneath it, seems so much larger and will certainly catch the eye of all who see it. Bead set on each side are three single cut diamonds that total 0.06 carats and add the right amount of sparkle to emphasise and highlight the elegance and craftsmanship of this beautiful ring. Perfect as an engagement ring, it measures 7.2mm at the centre by 14.3mm from one end diamond across to the other end diamond. This ring shows why Art Deco jewellery is as popular today as when it was first made all those years ago. 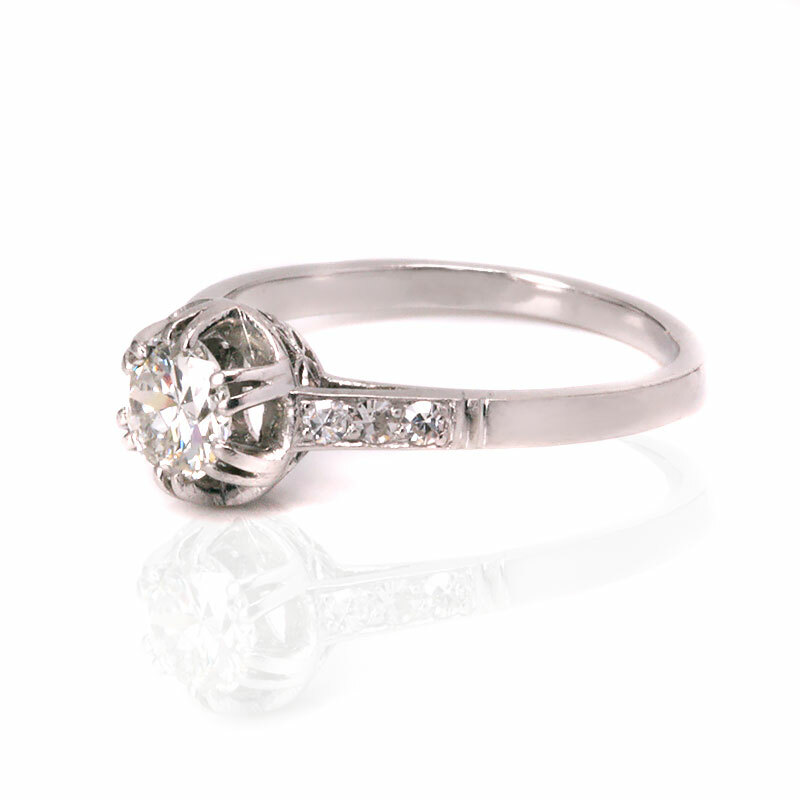 Tag: Art Deco Diamond Engagement Ring. Art Deco diamond engagement ring handmade in platinum the 1920’s. 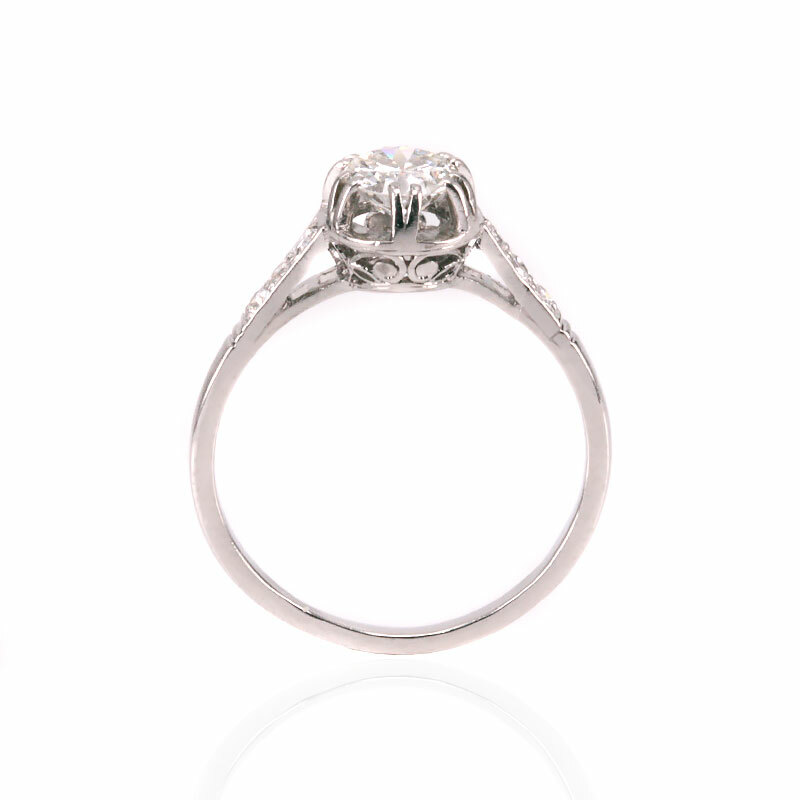 This Art Deco diamond engagement ring takes the traditional diamond solitaire and adds a magnificent scalloped plate below the centre diamond. Vintage and Art Deco engagement rings are so unique in their design and when they are hand made guarantees that there will never be an identical one in the world. The Art Deco movement was from 1920 to 1940 and was such a big influence on not just jewellery, but other aspects of life such as the design and style of cars as well as architecture such as the iconic and beautiful Chrysler Building. Even after all these years, without a doubt genuine Art Deco diamond engagement rings is the most popular and sought after style for engagement rings.